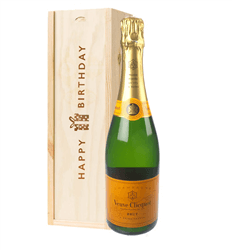 A single bottle of Veuve Clicquot Yellow Label NV Champagne. Veuve Clicquot signature brut non-vintage is loved the world over for its crisp, full flavors, excellent quality the celebratory yellow label remains to be one of the best selling Champagnes. We present this in a wooden gift box lined with wood wool. Personalize by adding your own personal message.